My Disney Wedding is Complete! | What's Up With The Mouse? Fortunately the drive was uneventful (always a good thing when driving long distances with 3 girls, ages 15, 12, and 9). Once we arrived at Disney, we had a couple of days to enjoy ourselves with virtually no wedding prep work to worry about. Most of our guests were arriving the day before the wedding and not staying long after the wedding that we didn’t plan too many activities outside of the wedding. So I will jump right to the wedding day. The wedding day seemed like a normal day. I woke up, grabbed some breakfast in the lounge (We were staying at the Beach Club, concierge level – it was fabulous! ), went and did some shopping for jewelry for my girls in the store, cleaned out the car so there would be room for us to ride to our dinner, then headed back upstairs to relax. No chaos, it was so nice. The staff at the Beach Club were able to reserve a “get ready” room for Carl. They were SO accommodating. Carl headed down to his room around 11 and we waited for some of our guests and the hair and makeup person to arrive. My friend and her boys arrived around 11:15. Her job was to steam my dress and my girls dresses with the portable steamer she brought from home. I provided all of the kids with an activity packet of mazes, word searches and crossword puzzles, along with some candy. With some cookies and chips from the lounge and some fruit from home, we had enough to hold us over until later. My stylist, Rosie from Beaute Speciale, arrived promptly at noon and was ready to start on my hair and makeup. I know my hair doesn’t hold curl well in humidity so I warned her ahead of time so she could do my hair accordingly. I didn’t have an exact style in mind, just a partial up ‘do with my tiara (no veil for me). She started and she was so relaxing. We chatted about tv shows we both watch and it kept my mind off the rest of the day. As Rosie was doing my hair, my sister arrived and she sent her boyfriend to Carl’s room. My niece also arrived. She is currently a Fairy Godmother at Bippity Boppity Boutique at Disney and she was kind enough to do all 3 girls hair… With the help of some ideas from Rosie, she was kept busy doing a fishtail braid, sideways french braid with a bun at the bottom, and a waterfall braid. After Rosie was done with my hair, I went outside for a bit to do a humidity test. It was looking very overcast and the humidity levels were very high. I wanted to make sure it stayed before she left and it was staying. The real test would come later on. Then it was makeup time. I don’t wear a lot of makeup and she did a great job of giving me a natural look. Rosie packed up and left. I then dressed and as soon as I was done the photographer, Randy Chapman of Chapman Photography, was at the door. As soon as he walked in the door he started snapping pictures of everything… me, my girls, my guests, the gifts, the buttons, the goody bags, you name it. I put on my finishing touches and was ready to relax!?! The next knock at the door was my “day of” planner, Jayne, from Just Marry. Of course she was like the grimm reaper coming with bad news. There was a storm threatening and she needed a decision asap on moving the ceremony inside instead of on the beach. She said they would need about 45 minutes to set up the arch inside. Ugh! Not what I wanted as everything was planned for the beach. She said she would call me in about 30 minutes so I had some time to think it over. She left shortly after carrying everything for my ceremony. I spent the next 30 minutes looking over the radar and talking to Carl to see what he thought. Randy thought we should just go ahead with outside and just pick a location to run to if it starts to rain. The way the radar was looking, and the speed, or lack of, that is was moving, really concerned me. Around 3 I decided to move it inside 🙁 We took a couple of last pictures in the room before we left to catch the boat to the Swan. Up to this point I have been surprisingly calm, but definitely not happy about moving my wedding indoors. The number one thing I wanted was a ceremony on the sand 🙁 Anyway, on with the show! We headed to the Yacht and Beach Club boat dock. No sooner did we walk out the door and walk a couple of steps, one of the girls was saying she felt rain drops. Oh no! The rain was coming and I could smell it in the air. The walk to the dock was about 5 minutes, tops. We turned the corner and we were almost to the dock when we saw the boat pull out. We figured the next one would be arriving shortly. As soon as we got to the start of the dock, a downpour started. Randy said my choices were to go to the lighthouse or to go to the Yacht Club. I chose lighthouse. As soon as we turned, the kids took off running for cover while the rest of us followed. Fortunately I had Randy’s umbrella! The lighthouse would become our home for the next hour. The sky opened up and it poured, with thunder, lightning and wind. At one point wind and rain seemed to be coming in from all sides of the lighthouse. Did you know that boats won’t operate when there is lightning and thunder??? Well, in case you didn’t, I can assure you that they don’t. Carl was stressing at the Swan (and having a drink) and we were stressing in the lighthouse. After many calls between Carl and me, Randy and the planner, the planner and me, and Carl and the planner and front desk, they came up with a plan. Their plan had to be better than mine because mine was wait it out 😉 About an hour after waiting in the lighthouse, my ride arrive — a covered stretch golf cart. My version of Cinderella’s carriage. When we arrived at the Swan, they made sure Carl was out of sight. This was the start of my feeling rushed. I wanted to use the restroom and I was rushed there. Then I wanted to have my girls and my dress touched up with the steamer and they huffed about that but found a room for us to use. I kept feeling like they were asking are you ready yet, are you ready yet?! Finally, we were ready. As my girls and I were standing behind the back doors of the conference room, I started hearing the harp play Imperial March (yes, Star Wars) ~ that was Carl’s entrance song for the ceremony. The next song to be played was Once Upon a Dream. I started crying as I heard it. That song has special meaning to me because I used to sing it to my girls when they were little (and they were in the phase of watching Sleeping Beauty 100x a day). I tried to pull myself together but I’m not sure I did a good job of it. Then my entrance song came on, Someday My Prince Will Come. Carl met me halfway down the aisle. The cermony was about 20 minutes long. We exchanged vows, had a sand ceremony to the song A Whole New World and Rev. Tim said some prayers for us and our family. Our recessional song was Under the Sea. We had a wonderful cake from It’s Tasty Too! It was a two layer beachy theme. The top layer was carrot cake, bottom layer was funfetti. Yum! By this time, most of the rain had stopped and we were able to take pictures around the Swan resort. After taking pictures around the resort, we took the boat back to the Beach Club. We took boat pictures, beach pictures, then drove over to the Polynesian for some more pictures on the beach with the castle in the background and, of course, a trip around on the monorail. Randy Chapman took his last pictures around 7:45, as it was getting dark. We said goodbye to him and met the rest of our party for dinner at ‘Ohana. We were seated about 8:15 at one long table. We sat down and everyone started clinking their plasticware so we could kiss. It was very much like a traditional wedding receiption in that sense. I started the drink orders with ‘Ohana’s famous Lapu Lapu served in a pineapple. A few other guests followed suit 🙂 It was very good! Everyone loved the food that was served. We started with some warm pineapple bread, a mixed greens salad, chicken wings and pot stickers. Then servers walked around with huge skewers of beef, turkey, pork and shrimp. Egg noodles tossed in a peanut sauce and stir fried vegetables were also served. There were 3 dipping sauces as well. The kids were able to order off of a kids menu. Dessert was bread pudding with ice cream. The kids were able to get up and participate in hula lessons and coconut races. Auntie, who interacts with the guests and coordinates games with the kids, pointed us out to the whole restaurant early in the evening. Later in the evening, she had us stand up, exchange leis and have a first dance. We watched Wishes (the fireworks) from inside since we hadn’t finished by 10pm. We then said our goodbyes and headed back to our resort. I planned one event for the following evening, an Illuminations boat ride, hoping to invite a few family members and friends that weren’t visiting the parks so they could have time to experience a little bit of Disney with us. Unfortunately, even though they said yes, everyone backed out on us at the last minute. It was a fun experience, but expensive for just a family of 5. I have to say that planning a wedding from 1200 miles away is a daunting task, but it can be done. 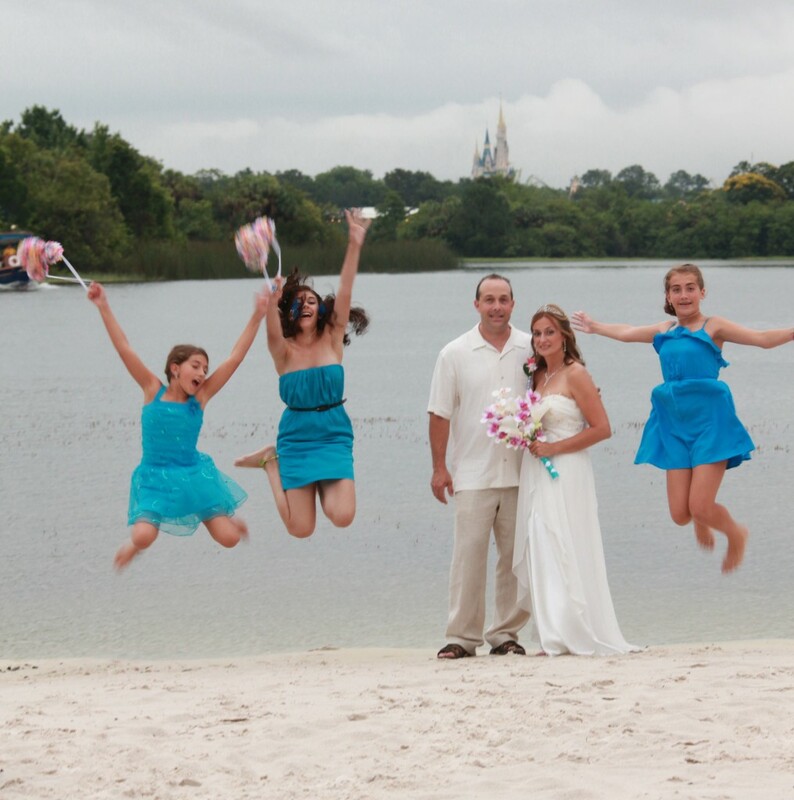 I relied heavily on past Disney brides reviews of various vendors and I wasn’t disappointed. Disney’s Beach Club concierge level cast members were fantastic. They made us “Just Married” buttons, helped us obtain a room for Carl to get ready in, and put up with all of the extra guests we had on the floor and visiting the lounge (when they really shouldn’t have been but I wasn’t there to say so). I would definitely stay there again. Rosie, from Beaute Speciale, was fabulous. I wouldn’t hesitate to recommend her/them to anyone planning a wedding. She was able to take my “something partially up and down with a tiara” and make a beautiful hairstyle. Randy Chapman, of Chapman Photography, was wonderful. He spent about 6 hours with us, rain and all, and provided me with about 6 CDs with over 2000 pictures and all of the rights. I would highly recommend him to anyone getting married or just heading down to Disney to do a family shoot. He does any event (engagements, birthdays, family shoots). Everyone that has seen his pictures raved about them. The best thing was he was very reasonally priced. Christine McPhail was the harpist that played for my ceremony and cake cutting. I loved her. She was so easy to work with and walked me through the ceremony and gave plenty of song suggestions. All of my guests said they loved her as well. Rev. Tim Herring was really good. We did disagree on how the sand ceremony should work (he wanted couple only, I wanted with our girls) and in the end he did what I wanted. He was very personable during the ceremony. Again, family and friends said he did a good job. It’s Tasty Too made and delivered our wedding cake. It was SO delicious. They were also very reasonably priced. Definitely cheaper than going through the Swan bakery. Again, I wouldn’t hesitate to recommend them for any event. The dinner at ‘Ohaha was awesome. I was able to book the reservation at exactly 6 months in advance through a manager. Everyone loved the food and said they would go back again. The entertainment added some fun to the dinner and was great for the kids (and grown up as well). Karen, from Just Marry, was my wedding planner leading up until the week before the wedding. She was great to work with. Now the “day of” planner left a lot to be desired. If I were to do this again, I would have a lot more conversations surrounding the day of and what the plans are if we need to move the wedding indoors. The room we had was probably the ugliest conference room I have ever seen and I don’t look at those pictures at all. The Swan/Just Marry need to work on a better backup location, such as an atrium or covered gazebo, that can be used for inclement weather. I really wanted to save money wherever possible and I think I was able to by doing a lot of projects. Flowers were obscenely priced for a bouquet in Disney (about $250 for a tropical bride’s bouquet). I was able to go through Michael’s, the craft store, and have a tropical bouquet made to order with the real feel flowers for $45, including flowers and assembly. I was also able to add shells to it to give it a personal touch. For the girls I made Mickey flower balls. They were very easy to make, just time consuming. With a couple bottles of wine and some friends, we were able to make 3 of them. I also made small flower balls for the chairs to add some color to the aisle. The Mickey fans were very cute, but even more time consuming. I don’t have a paper cutter so I had to cut each one by hand. That meant cutting out 4 mickey heads for each fan (times 20 fans). It did allow me time to catch up on some recorded TV shows. I really loved them, but would probably find a paper cutter if I had to do it all over again. I wanted to have a personal touch for every family that came to celebrate with us so I made a disney 4×6 fabric-covered photo album for each family. They didn’t take much time and a few friends said they loved them. I created a couple of newsletters and sent out information with the invitations, which I created as well, on where to park at the resort (to avoid paying a parking fee) and other random pieces of information but I felt like no one really read it. We heard complaints about paying $15 for parking at the Swan when they could have parked at the Beach Club for free. I would probably skip the newsletters again since they didn’t seem to be read. Now that all of the planning and celebrations are done, I don’t know what I will do with my free time. Maybe plan a return trip to Disney or plan a honeymoon since we didn’t have one yet. 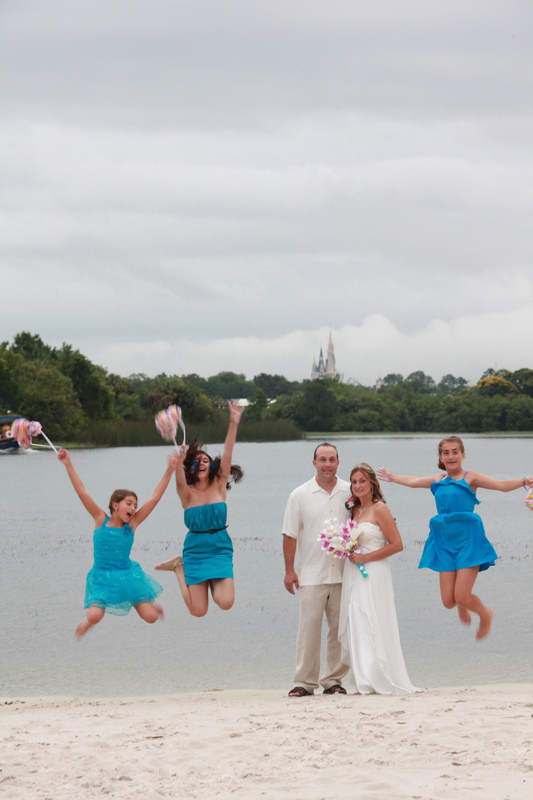 This entry was posted in Disney Swan Wedding, Disney Wedding. Bookmark the permalink. One Response to My Disney Wedding is Complete! Pingback: The Walt Disney World Swan and Dolphin, a Pictorial Resort Review | What's Up With The Mouse?